We’d love your help. Let us know what’s wrong with this preview of Tomb of the Golden Bird by Elizabeth Peters. Convinced that the tomb of the little-known king Tutankhamon lies somewhere in the Valley of the Kings, eminent Egyptologist Radcliffe Emerson and his intrepid wife, Amelia Peabody, seem to have hit a wall. Having been banned forever from the East Valley, Emerson, against Amelia's advice, has tried desperately to persuade Lord Carnarvon and Howard Carter to relinquish thei Convinced that the tomb of the little-known king Tutankhamon lies somewhere in the Valley of the Kings, eminent Egyptologist Radcliffe Emerson and his intrepid wife, Amelia Peabody, seem to have hit a wall. Having been banned forever from the East Valley, Emerson, against Amelia's advice, has tried desperately to persuade Lord Carnarvon and Howard Carter to relinquish their digging rights. But Emerson's trickery has backfired, and his insistent interest in the site has made his rivals all the more determined to keep the Emerson clan away. Powerless to intervene but determined to stay close to the unattainable tomb, the family returns to Luxor and prepares to continue their dig in the less promising West Valley—and to watch from the sidelines as Carter and Carnarvon "discover" the greatest Egyptian treasure of all time: King Tut's tomb. But before their own excavation can get underway, Emerson and his son, Ramses, find themselves lured into a trap by a strange group of villains ominously demanding "Where is he?" Driven by distress—and, of course, Amelia's insatiable curiosity—the Emersons embark on a quest to uncover who "he" is and why "he" must be found, only to discover that the answer is uncomfortably close to home. Now Amelia must find a way to protect her family—and perhaps even her would-be nemesis—from the sinister forces that will stop at nothing to succeed in the nefarious plot that threatens the peace of the entire region. To ask other readers questions about Tomb of the Golden Bird, please sign up. A great read! The first part was fun for me since I always enjoy reading about Howard Carter and the discovery of King Tut's Tomb. This part of the book didn't pull me along though and I could put the book down for other things. But the latter part of the book - the usual madcap adventures and mystery were very compelling and I read late into the night. This review has been hidden because it contains spoilers. To view it, click here. Last year when I read Elizabeth Peters' The Serpent on the Crown, I'd remarked that it really rather felt like someone else had ghost-written it for her. I am bummed to observe that the next installment in the long-running Amelia Peabody series, which has been near and dear to my heart for ages on end, really rather feels the same way. Not only were all the familiar characters just flat, flat, flat, not only was most of the on-screen activity just a lot of conversation reacting to the few suspen Last year when I read Elizabeth Peters' The Serpent on the Crown, I'd remarked that it really rather felt like someone else had ghost-written it for her. I am bummed to observe that the next installment in the long-running Amelia Peabody series, which has been near and dear to my heart for ages on end, really rather feels the same way. Not only were all the familiar characters just flat, flat, flat, not only was most of the on-screen activity just a lot of conversation reacting to the few suspenseful bits of the story, but there were also a couple of mistakes in the prose that historically I've trusted Peters to just not do. Spelling "intelligence" with three l's was one example. But the one that jolted me harder out of the story was this. If you've been reading the Amelia Peabodies, you know that all the novels from about halfway through the series onward alternate between first-person POV for Amelia and third-person for her son Ramses. In this book, in one of the Ramses sections, I found a sentence where suddenly the paragraph was talking about "our expedition" doing this and that... as if somehow Peters had forgotten that she was in a Ramses section rather than an Amelia one. Either of those errors are certainly things I could see any writer doing--even the very best ones. And maybe I'm just more sensitive to screwups like that in text, maybe the copyeditor just happened to miss those when the book was being edited... but. Between these two little screwups and the overall flatness of the prose, it just really made the book not feel like Peters at all. So what was this book about? Mostly, it was about Howard Carter discovering King Tut's tomb--and how the Emersons were on the sidelines of it without really being involved in that dig at all. While I do appreciate how Peters arranges things to respect actual history and keep them out of the direct limelight with those goings on, it also made for kind of frustrating reading--since you only really got to see the wonders of what was in that tomb in brief and scattered glimpses. Which really, really diminished the dramatic impact. The other plotline, involving conspiracies and coup and assassination attempts, suffered from the same problem as in The Serpent on the Crown. We see very little actual action involved with this plot, and a whole lot of Emerson Clan As Talking Heads Having Endless Councils of War. There are way too many councils, and just not enough war, as it were. Now, all these things said, there are several things here that also make me cut the book some slack. For one thing, Peters is now 80 years old, and that's a venerable age indeed to still be writing, especially working on your eighteenth book in a long-running, best-selling series (not to mention HOLY CRAP, eighteenth book, how on earth do you keep the series lively after so many installments?). For another, Amelia herself as well as her husband are aging; the first Amelia book was set way back in 1884, and this one's in 1922. For a third, the Emerson Clan is definitely a clan by this point in the timeline, with not only Amelia and Emerson, but also Walter and Evelyn, Ramses and Nefret and their twins, the adopted girl Sennia, Ramses' best bud David and his wife Lia (Walter and Evelyn's daughter). So all in all I kind of can't blame Peters for the shift over to more domestic plots... but damn, I miss the days when Amelia and Emerson were still young and vigorous, and Ramses was getting old enough to be an active force as well. Last but not least it is worth mentioning that according to things I've read, Peters has announced that she won't write any more Amelia Peabodies after the 1922 discovery of King Tut's tomb... though it is unclear whether this means "no more Amelia Peabodies at all" or just "no more set chronologically after 1922". The ending of this one, given this, is rather sweet and aww-inducing and a nice note on which to go out. But I'll have to admit that if Peters is losing the luster off her writing--or if, as I suspect, she's actually got a ghost writer now because she's just old--then yeah, it's time to stop. Elizabeth Peters is back! I love the whole huge family and endless list of characters! This book is meant to be the unfinished and unofficial end to the Amelia Peabody series. Amelia uses one of her famous lists to check off all of the loose plot elements that have been hanging out for several books now. I LOVED it, and especially appreciated all of those little surprises that make it a true Elizabeth Peters success. I’ve been reading these books for so long that I decided it was time to settle s Elizabeth Peters is back! I love the whole huge family and endless list of characters! This book is meant to be the unfinished and unofficial end to the Amelia Peabody series. Amelia uses one of her famous lists to check off all of the loose plot elements that have been hanging out for several books now. I LOVED it, and especially appreciated all of those little surprises that make it a true Elizabeth Peters success. I’ve been reading these books for so long that I decided it was time to settle some of my long unanswered questions. I skimmed Amelia Peabody’s Egypt and was shocked that fiction and fact were shamelessly combined. So I began my search for the facts. Elizabeth Peters is in fact Barbara Mertz, with a PhD in Egyptology. Elizabeth and Peter are her two children. She has written three nonfiction books using her real name. She has also written under the name Barbara Michaels. In total she’s written over seventy books. Her heroine, Amelia Peabody, is inspired by Victorian amateur Egyptologist Amelia B. Edwards, Lady Hilda Petrie: the wife of British Egyptologist Sir William Flinders Petrie, and is semi-autobiographical, laced with the feminism and feelings of a woman who was a pioneer in her time, receiving a doctorate degree from a prestigious university in a decidedly unfeminine subject in 1952. All three of her inspiring sources were pioneers in their own way, breaking through barriers of sexism and society. Amelia’s husband, Radcliffe Emerson, is inspired by Sir William Flinders Petrie. Sir Petrie’s exacting excavation methods were unprecedented and set the methodology for future archaeologists. The Emersons’ discoveries (when they were actual real discoveries) were in fact discovered by Petrie, Carter, or some of the other real archaeologists who frequent the pages of Peters’ novels. Copyright mpmbooks.com 2004, used with permission. Are any of the main characters in the Amelia Peabody mysteries based on real people? The only main characters which were inspired by real people are Amelia Peabody (based on Victorian amateur Egyptologist Amelia B. Edwards) and Emerson (whose methodology has been attributed to William Flinders Petrie). In the pages of the Amelia Peabody Mysteries, we also meet real historical persons, such as Gaston Maspero, Sir Evelyn Baring, Howard Carter, and Emil Brugsch, voices of the archaeological community in the late nineteenth century and early twentieth centuries. Amelia gets her name from Amelia B. Edwards, who wrote a Victorian travel book, A Thousand Miles Up the Nile. Amelia Peabody’s nickname, “Sitt Hakim,” or “Lady Doctor,” was the name the Egyptians gave Amelia Edwards’ own traveling companion on their Nile journeys. The Nile sail/houseboat (or dahabiyeh) that both the fictional and real Amelia traveled upon was called the Philae. Most of the archaeological achievements attributed to the Emerson-Peabodys were, in reality, accomplished by many of the archaeologists who pass through the novels as supporting characters. For example, the excavations that Emerson and Walter are undertaking at Amarna in 1884 (in Crocodile on the Sandbank) are based on those conducted by Sir William Flinders Petrie in 1891. Peters has indicated that the character of Radcliffe Emerson is based in part on Petrie, whose meticulous excavation habits were legendary and set a new standard for archaeological digs. Amelia herself was partly inspired by Amelia Edwards, a Victorian novelist, travel writer, and Egyptologist, whose best-selling 1873 book, A Thousand Miles up the Nile is similar in both tone and content to Amelia Emerson's narration. The character was also semi-autobiographical: pressures on Amelia to marry and abandon her Egyptological career in the first book were based on Peters's own experience in academia. In other instances, fictional accomplishments are ascribed to Amelia and Emerson. For example, the tomb of the 17th Dynasty Queen Tetisheri, whose discovery and excavation form the basis of the plot in The Hippopotamus Pool has, in fact, never been found. Most scholars suggest that the tomb - assuming that it still survives - would be found in the general area where the Emerson-Peabodys discover it. The intact Old Kingdom burial found in The Falcon at the Portal is also fictional; in fact, no intact burials from the Old Kingdom period have ever been found. 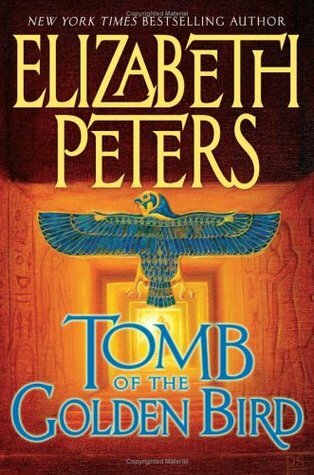 In a 2003 book talk at the Library of Congress, Elizabeth Peters revealed that her overall plan for the Amelia Peabody series was to continue the series chronologically through World War I and end with events surrounding the discovery of the tomb of Tutankhamun in 1922. This stated goal was accomplished with the publication of Tomb of the Golden Bird in 2006. The events of that book wrapped up most of the series' loose plot lines, although it did not include a definitive ending to the series itself. In the same talk, Peters suggested that any future installments after this point would "fill in the gaps" in the series' chronology, as she has done with Guardian of the Horizon and A River in the Sky which fill part of the four-year gap between The Ape Who Guards the Balance and The Falcon at the Portal. In the final volume of the Vicky Bliss series, The Laughter of Dead Kings, the fictional editor of Amelia Peabody's journals makes a cameo appearance while looking for more of Amelia's journals. By the end of the book, she has acquired at least three more of the "missing journals" to document the adventures of the Peabody-Emersons. While this appeared to suggest Peters's intention to continue the series (which was by far her most commercially successful), only one additional volume was published before her death in 2013. "If I had intended Crocodile to be the first in a series, I probably wouldn't have been as specific about dates. Not only did Amelia inform the reader of her age (curse her! ), but historical events mentioned in the book tied it to a particular year. As the series continued, there was no way I could get around this, or fudge the date of Ramses' birth, or keep him and his parents from aging a year every twelve months." According to this timeline, Amelia would be seventy years old in the eighteenth book, Tomb of the Golden Bird. In The Hippopotamus Pool, however, the Introduction contains what is supposed to be an excerpt from "The National Autobiographical Dictionary (45th edition)", in which Amelia herself states that she was her late twenties at the time of her first visit to Egypt. The statement is footnoted, and the footnote provides specific instructions not to question the discrepancy (pp. xii and xvi.). In Seeing a Large Cat, Emerson's age at the time they married is given as 29. The latest chronological mention of Amelia is in the compendium Amelia Peabody's Egypt: A Compendium, which mentions her taking a souvenir from her visit to Egypt in 1939, as war is looming and she was uncertain that she would ever return. Her age is given as 87, which would be correct according to the original timeline. In the 18th book of the Amelia Peabody series, we join the archaeological Emerson family in 1922 Egypt for another digging season. Radcliffe Emerson is sure a major find is still waiting to be discovered in the Valley of the Kings. Professor Emerson is trying to dissuade the wealthy Lord Carnavon and his hired archaeologist, Howard Carter, from continuing their work and giving the concession to him. Unfortunately Carter and Carnavon want one last season, in which they will soon discover where Tu In the 18th book of the Amelia Peabody series, we join the archaeological Emerson family in 1922 Egypt for another digging season. Radcliffe Emerson is sure a major find is still waiting to be discovered in the Valley of the Kings. Professor Emerson is trying to dissuade the wealthy Lord Carnavon and his hired archaeologist, Howard Carter, from continuing their work and giving the concession to him. Unfortunately Carter and Carnavon want one last season, in which they will soon discover where Tutankhamen is buried. I've been looking forward to this installment of the series for some time. I've always wondered how they would combine the real-life discovery of King Tutankhamen's tomb with the fictional story of “the world's greatest archaeologist”, Radcliffe Emerson. I enjoyed discovering how Amelia manages to get in on the excitement of the discovery and how she and Emerson refuse to be thwarted by Carnavon and Carter. I really enjoyed seeing how the author slipped in the storyline of how Professor Emerson might have been responsible for letting loose the Mummy's curse that ends in the deaths of Carter and Carnavon, along with other members of the crew. Reading chronologically this is the last book in the series, and I found that quite sad. So it was a bit hard for me to listen to it dispassionately. :) It's a good story that moves well and doesn't throw in every character who ever appeared, which is a relief. I did find myself wishing Peters had played with history and let Emerson or Cyrus find King Tut's tomb. But it wasn't to be and she did manage to have them on site a lot. Revisiting the series, I find myself a little less enchanted with t Reading chronologically this is the last book in the series, and I found that quite sad. So it was a bit hard for me to listen to it dispassionately. :) It's a good story that moves well and doesn't throw in every character who ever appeared, which is a relief. I did find myself wishing Peters had played with history and let Emerson or Cyrus find King Tut's tomb. But it wasn't to be and she did manage to have them on site a lot. Revisiting the series, I find myself a little less enchanted with this story. Emerson - and the rest of them - behaved really badly and I couldn't help but think they deserved what they got. So having them continue to complain about the unfairness throughout the book began to get on my nerves. Plus, I thought there could have been more plot and less about the tomb, since it wasn't theirs anyway. Another element that bothered me is the relationship between Sethos and Margaret; I dislike them together. Also, and this is a small thing, but why did David leave his family at Christmas to come to England? That's very out of character for him and I really needed a couple of sentences for explanation but never got them. The Emersons are back in Egypt for the archeological season of 1922-1923. They are a bit of a loss, however, as David has decided to stay behind in England with his family and career as an artist/illustrator and all the staff they've ever hired turn out to be murderers or victims of murder. Oh dear! After some mysterious happenings in Cairo, the family quickly retreats to Luxor where they feel safe. Emerson hopes to persuade Lord Carnarvon to cede his concession in the East Valley. The Earl and The Emersons are back in Egypt for the archeological season of 1922-1923. They are a bit of a loss, however, as David has decided to stay behind in England with his family and career as an artist/illustrator and all the staff they've ever hired turn out to be murderers or victims of murder. Oh dear! After some mysterious happenings in Cairo, the family quickly retreats to Luxor where they feel safe. Emerson hopes to persuade Lord Carnarvon to cede his concession in the East Valley. The Earl and his archeologist, Howard Carter, have no intentions of giving up on finding a lost royal tomb. When they finally achieve success beyond their dreams, Emerson burns bridges with both Carter and his patron and so the Emersons are banned forever from viewing the incredible new tomb, let alone helping with the work. Amelia sets her mind to figuring out another mystery, one that may involve a certain roguish family member. Has he finally reformed for good or is he tempted by the riches of Tutankhamun's tomb? This is the last entry (chronologically) in the series and it suffers from a disjointed plot where nothing much happens. The archeology plot is certainly fascinating but it gets boring once Emerson loses his temper. That plot is mostly dropped in favor of confusing political intrigue. I wasn't really interested in the politics of the Middle East and Abdullah told Amelia to stay out of it, it doesn't concern her. I did really enjoy the moments between family members. The characters really live and breathe and it is delightful watching them interact. I love the tender, private moments between Amelia and Emerson. He loves her so much! It's just so sweet but I do understand her frustrations. I find her constant attempts to pick a fight just to initiate more private interludes a little annoying after a time. Amelia is so smug and a bit overconfident at times but that's who she is and why we love her. Emerson's temper really gets the better of him this time. I think I would probably be frustrated as well but what can you do except offer to help? His outbursts of temper were a bit uncalled for. There's not as much about Ramses and Nefret as in previous books. They're hardly ever alone. There are two big moments when their feelings for each other are allowed to show through. Otherwise the focus is on their children. Charla is a spoiled brat and in need of a good spanking. I find her insanely annoying and would never put up with that kind of behavior. David John is sweet but a little overly precocious. The animals fail to appeal to me as well. David, Sennia and Gargery come out for Christmas. Sennia is as self-confident as ever but now she has the poise and manners of a young English woman. She still has her loving heart and can never truly be ruined by English schooling. Gargery is too funny and I love how he has his own little action subplot in his old age. David's story surprised me. I can't believe it! Sethos is a complicated individual. I find him charming at times but also maddening because of his reticence. I trust his story and I trust he is reformed. He is not a very good husband to Margaret. I don't blame her for being angry but she is also partly at fault for their estrangement. I don't really like her much. She's even more smug and annoying than Amelia. Their plot finale is very sweet. As always Selim, Daoud, Fatima and Kadija are loyal members of the family who add another layer of richness to the story. Selim is not as present as in previous books but still obsessed with motorcars. Daoud, the big galoop, has a major role to play here. He is more important than comic relief. Cyrus and Katherine seem to be doing well. It is nice to see her looking healthy and feeling better now Bertie is well again and so helpful to his stepfather. Bertie doesn't have much to do here. He's a sweetheart but not as quick on the uptake as the Emersons. Jumana has turned into a lovely young woman, dedicated to her profession but some of her petty behaviors here show she is still young and a bit immature. Cyrus and Emerson have some newcomers on staff. Mademoiselle Suzanne Malreaux is an Anglo-French artist who may not be what she seems. I guessed her story almost immediately. It surprises me that it took Amelia that long! Nadij is a new excavator. He comes highly recommended but is quiet and doesn't have much to say or do. Suzanne's grandfather, Sir William Portmanteau, a wealthy English industrialist, is not a very nice person. Making allowances for being a man of his time and place would be allowed at first because those prejudices were expected, but once he gets to know people and still makes rude comments, he becomes persona non grata. The reader will not like him at all. Carnarvon and Carter do not come off very well here. I was a little surprised at how petty and childish they acted. Carter's ego swells to enormous proportions now he has made such an important discovery. By rights it should be Emerson's discovery but it's not. Carter doesn't have to rub it in and be so rude. He could use the help but knowing Emerson won't allow anyone to take any of the treasure, he refuses Emerson's help. The treasure belongs to Egypt for all to see. I can't wait to see pictures of the new Grand Egyptian Museum! Emerson would be so pleased! Journalists get a bad reputation here too, flocking around like a pack of vultures. Kevin O'Connell returns for a story and gets on Amelia's nerves. I think he likes to push her buttons. He is a roguish sort but not a bad man, I think. He's trying to make a living and sensational journalism is the answer. I don't like it any more than Amelia but he seems to respect the Emersons. I love historical fiction, and I love series fiction. Ms. Peters (or Mertz, or Michaels) has been an inspiration to me for over a quarter-century. When I was a very young mother, and had all the time in the world for reading and writing, Ms. Peters' books stimulated my intellect and aroused my imagination. I had no college, and through Vicky Bliss and Amelia Peabody I was inspired to learn who John Donne and Howard Carter were, to read Shakespeare and listen to Handel, and to reach for independen I love historical fiction, and I love series fiction. Ms. Peters (or Mertz, or Michaels) has been an inspiration to me for over a quarter-century. When I was a very young mother, and had all the time in the world for reading and writing, Ms. Peters' books stimulated my intellect and aroused my imagination. I had no college, and through Vicky Bliss and Amelia Peabody I was inspired to learn who John Donne and Howard Carter were, to read Shakespeare and listen to Handel, and to reach for independence. I visited, through Ms. Peters' stories, Rome and Munich, Luxor and Cairo. I went into tombs and through pig stys, across dry deserts and frozen mountains. I went to college in real time, learned more about the references in her books, gained even more inspiration, and kept writing. Ms. Peters' work continues to inspire me. The Amelia Peabody story is a fun and educational series that will appeal any woman who values independence and/or motherhood. Adventure, mystery, mother love and romance combine to make up fabulous entertainment. Amelia Peabody is my hero. I have read everything Elizabeth Peters has written. Several times. I LOVE the Emersons, and when I manage to remember that they are not real people, I always regret the fact. BUT... I found this book dreary and depressing. The family seems to be drifting apart (the demise of the extended family) and everyone is very focused on their own individual "needs" so they can be fulfilled. I reread it twice, hoping I would like it better, but I just never did. The author manage Amelia Peabody is my hero. I have read everything Elizabeth Peters has written. Several times. I LOVE the Emersons, and when I manage to remember that they are not real people, I always regret the fact. BUT... I found this book dreary and depressing. The family seems to be drifting apart (the demise of the extended family) and everyone is very focused on their own individual "needs" so they can be fulfilled. I reread it twice, hoping I would like it better, but I just never did. The author manages to inject her political opinions, which is certainly her perogative and I have never had a problem with before, but this time, it's so anachronistic and distracting! Also, I think she should kill off that tedious and obnoxious Margaret Minton and marry Sethos to Fatima. Margaret never developed a character - she is just a collection of rude behaviors and attitudes. The idea that Sethos could love her never feels very believable, and it never gets better. Oh, and Jumana... another character who never appears anything other than irritating. She may be pretty and smart, but she is not lovable at all, which makes her seem a little unlikely as a companion for a guy like Bertie. I wish I had not read this book. It left a taste of ashes in my mouth, after 20 years of reading and loving Amelia and her family. This is the first Elizabeth Peters book I have ever read and I liked it. The characters all were well developed and Amelia Peabody was a force of nature. She holds the reigns over everyone but not obnoxiously; she does with a quiet, or maybe not so quiet but strong will. I was a little disappointed that the mystery was not more about the tomb but that being said it was a really good, cozy, mystery. I don't usually read cozy type mysteries but I plan to look into more of this series. I so disliked the previous installment in the Peabody-Emerson chronicles that I waited 4 years to read this one. While it is a measurable improvement on that one -- Nefret is no longer a hormone-crazed neurotic and the children are no longer monsters that only a doting grandmother could love -- the worlk is curiously subdued, with a regrettable absence of action and danger. Personalities seem muted; Amelia restrains Emerson far too often. Not a single "refreshing discussion;" not a single shirt I so disliked the previous installment in the Peabody-Emerson chronicles that I waited 4 years to read this one. While it is a measurable improvement on that one -- Nefret is no longer a hormone-crazed neurotic and the children are no longer monsters that only a doting grandmother could love -- the worlk is curiously subdued, with a regrettable absence of action and danger. Personalities seem muted; Amelia restrains Emerson far too often. Not a single "refreshing discussion;" not a single shirt ruined. The focus of the work is on the discovery of the tomb of Tutankhamon, rather than on the work of the Emersons or threats to their life. The few events that promise to incite some excitement quickly fizzle, either because they take place at a distance or are revealed as tempests in teapots. The only dead body in the first 3/4 of the book is an elderly man clearly dead from natural causes. And there are just too many characters. It's as though the publishers insisted that Peters include everyones' favorites, yet keep the work to under 400 pages. Many of the appearances are only slightly more than cameos. It feels more like a swan song than anything else. We are given an opportunity to say good-bye to all our favorite characters, but in a sadly unemotional fashion. I'd much rather that they go out with a bang than nary a whimper. Finally, the work is unusually overwritten. Too much is explained that is unnecessary and would be better left to the imagination of the readers. Again, I blame the publishers, who seem to be insisting that authors write to the lowest common denominator. I went to re-read this after reading Lady Almina and the Real Downton Abbey: The Lost Legacy of Highclere Castle about the real Carnarvon family. Lord Carnarvon was a British aristocrat and amateur Egyptologist who sponsored Howard Carter's excavations, leading to the discovery of King Tut's tomb. Tomb of the Golden Bird is part of a series of mysteries whose main characters, the Emerson family, are English archeologists excavating in Egypt. The book combines their fictional story with the actual I went to re-read this after reading Lady Almina and the Real Downton Abbey: The Lost Legacy of Highclere Castle about the real Carnarvon family. Lord Carnarvon was a British aristocrat and amateur Egyptologist who sponsored Howard Carter's excavations, leading to the discovery of King Tut's tomb. Tomb of the Golden Bird is part of a series of mysteries whose main characters, the Emerson family, are English archeologists excavating in Egypt. The book combines their fictional story with the actual discovery of the tomb. Lord Carnarvon and his daughter Eve appear briefly and Howard Carter is present throughout. This was the first of the Amelia Peabody adventures that I had read. For me, the book was just OK. Perhaps if the reader is an Amelia Peabody fan (fan status, I presume, obtained by reading earlier Amelia Peabody mysteries), one would find the book more interesting. I made it to page 226, and then decided that I didn't really care what happened to Amelia, and that I would rather read a more compelling story. It was over 20 years ago that I read the first book in the Amelia Peabody Mystery series. This is the 18th in the series, and I've read them all--and wished all of them were longer. What better recommendation can I give? Finished a re-read of this in audio. Although not the last written, it wraps up all of the main characters' stories very nicely. I love this series and this was another fun installment. If you haven't read any of this series before, don't start here - go back to the beginning, as there are spoilers for earlier books in the later ones. They really should be read in order. If you've read the earlier books, you probably aren't reading this review, and if you are - why? You love the series, if you've gotten this far, all I can say is that this is a worthy addition. The whiny, lovesick Ramses books are not my favorite, and than I love this series and this was another fun installment. If you haven't read any of this series before, don't start here - go back to the beginning, as there are spoilers for earlier books in the later ones. They really should be read in order. If you've read the earlier books, you probably aren't reading this review, and if you are - why? You love the series, if you've gotten this far, all I can say is that this is a worthy addition. The whiny, lovesick Ramses books are not my favorite, and thankfully, we don't have any of that here. Instead, we have 5-year old twins, who are even more precocious (and terrifying) than Ramses as a child, and I love them. Sennia, Gargery, and David make appearances, and we get our favorite reformed Master Criminal, as well. Howard Carter discovers King Tut's tomb, and Peters has a little fun rewriting history here. I didn't have this on the list of books I had read, but I am pretty sure that I read this a couple of years ago. It is a good installment in the series, but definitely not my favorite. I liked the earlier books best. The Tutankhamen one, with an intricate plot and so many characters I think even Barbara Rosenblat was getting confused. But - lovely lovely lovely to see old friends in top form. I like this series a lot. This was a particularly interesting convoluted, in the best way, story. This was a fun change of pace for me. I liked the history blended with the fictional British Egyptologist family. This would fall into my fluff read category, but it was a fluff read with a bit of depth at the same time, if that makes sense. I'm in the process of re-reading the entire Amelia Peabody series again, from start to finish in one go. They are still some of my favorite books. They must be read with tongue firmly inserted in cheek. It also helps to have an interest in and some knowledge of Colonial-era exploration narratives, fiction like that of H. Rider Haggard, Orientalist studies, the competitive acquisitive zeal of western museums at the turn of the century, and the "gentlemen archaeologists" of the 19th century who br I'm in the process of re-reading the entire Amelia Peabody series again, from start to finish in one go. They are still some of my favorite books. They must be read with tongue firmly inserted in cheek. It also helps to have an interest in and some knowledge of Colonial-era exploration narratives, fiction like that of H. Rider Haggard, Orientalist studies, the competitive acquisitive zeal of western museums at the turn of the century, and the "gentlemen archaeologists" of the 19th century who brought more treasure-hunting fever than academic and historical interest to their digs. That is to say nothing of the insight into early seeds and outbreaks of unrest in the Middle East that find their way into the middle and later novels in the series. Add to this impressive list of "ingredients" a dash of early feminism, British upperclass manners, interesting plots, and especially the academically sound Egyptian history from a legitimate scholar (Elizabeth Peters had a PhD in Egyptology from the Oriental Institute at the University of Chicago) and you have the very best in historical fiction, enclosed within adventurous and funny plots led by engaging and memorable characters who, though immensely more enlightened than many of their time, nonetheless remain realistic people OF their time, seeing the world through glasses tinted by their own culture and class. Though they attempt to rise above prejudice, they cannot quite entirely do so. Elizabeth Peters showed immense wisdom of the human condition in this aspect of her characterizations, reminding us all that we cannot even be aware of - much less remove - ALL of our preconceptions through which we see the world around us. Even the best of us - like Amelia - can continually peel back the layers of lenses through which we see the world. All these philosophical, aesthetic, academic, and historical reasons for loving the series are thus topped off with depth of characterization, imaginative storytelling, fast-paced plotting, excellent word-crafting, and an overall affectionate humor about the human condition - the whole coming together even better than the sum of its parts to make it one of my favorite series of all time. I might add that it's a series that I've read and re-read multiple times, something that I almost never do. To be fair, my one criticism about the series is that the non-chronological nature of the last few books gets a big confusing even to me, someone who's read them multiple times. They're still very enjoyable, but holding the timeline and chronology of events in my head is not always easy. I plan to tackle the compendium "Amelia Peabody's Egypt" soon to see how that clears things up. Nonetheless, I'm waiting with bated breath for the book Elizabeth Peters was finishing at the time of her death to be published. I think it would be a great tribute to her career to publish it posthumously. The Emerson family is in Egypt in the early 1920's. The tomb of Tutankhamon has not been discovered yet, but all the signs lead to that discovery being very near. Howard Carter is an acquaintance of Emerson and Amelia, but there has been a falling out. Carter is a person who has become overwhelmed by his own self-importance. Emerson's heart is broken because he will not be one of the first ones to see all the treasures to be found. Even from a distance, he is keeping watch to make sure that all protocols are being followed in order to ensure the safety of all the treasures to be found. It is nearing Christmas, and the entire family is gathering to celebrate. But as always in this family, there are mysteries in every direction. Sethos, Emerson's half brother has arrived unexpectedly. He is suffering from malaria, but he is also being followed by villains because of his work for the British Home Office. Emerson and his son Ramses have been assaulted. Gargary their elderly butler is kidnapped. There is danger afoot. Elizabeth Peters wrote the Amelia Peabody books with a sure knowledge of archeology and a wonderful sense of humor. She created characters who were amusing and adventurous and most of all wonderfully human creations. Amelia is a woman who is never in doubt of her superior knowledge. She is a manager of people, events and lists. She is well loved by her husband Emerson, her son Ramses and daughter-in-law, Nefret, her grandchildren and a great number of family and friends. Although she is overbearing and bossy, she continues to be surrounded by people who admire her. Emerson is a man of honor. He has pointed out certain conditions which point to the discovery of the tomb of Tut. But, because he let his sense of honor get the better of him, he has been excluded from any involvement with the discovery. He is a man who loves his wife and family beyond measure. Everything about him is larger than life. This story has murder, spies, plots and a great deal of adventure. Although it is part of a series, this book can be read as a stand alone. But, if you have never read any of the Amelia Peabody books, you are doing a great disservice to yourself. Because the background of this story is the discovery of Tut's tomb, there are many descriptions and discussions of archeology. That is one of the things I have always enjoyed about this series. I enjoyed this book. And that enjoyment has brought home to me, the wonderful hours I have spent sharing time with Amelia, Emerson and the entire cast of characters. Although, for me, there were slow spots which were not quite what I expect from Amelia, this is still one of the wonderful Elizabeth Peters' best books. Amelia and the rest of the sprawling Peabody-Emerson clan are back for yet another adventure featuring ... well, as Abdullah would have put it, "Every year, another dead body." It's the fall of 1922 in Luxor, Egypt, and Howard Carter is digging one last season in the Valley of the Kings in the hopes of finding anything buried under the sands before his benefactor, Lord Canarvon, pulls the funding away after several fruitless years. Amelia's archaeologist husband, Radcliffe Emerson, is fairly cert Amelia and the rest of the sprawling Peabody-Emerson clan are back for yet another adventure featuring ... well, as Abdullah would have put it, "Every year, another dead body." It's the fall of 1922 in Luxor, Egypt, and Howard Carter is digging one last season in the Valley of the Kings in the hopes of finding anything buried under the sands before his benefactor, Lord Canarvon, pulls the funding away after several fruitless years. Amelia's archaeologist husband, Radcliffe Emerson, is fairly certain that at least one tomb remains - that of the little known 18th Dynasty Pharaoh Tutankhamun, and he thinks he knows where to find it. The fun begins when Carter stumbles across a step in the rock, and Emerson fails to remember that the find is Carter's and not his own. Soon, the Emersons are banned from the Valley, and old friends and foes start popping out of the woodwork to make life complicated. The focus of this book is somewhat different than others in the series and those who've been wishing for a change of pace wll be pleasantly surprised to find that the focus of this book isn't the crime of the season, but the interactions of the Emersons themselves. If you've never read one of the Amelia Peabody books, you'll be completely lost (start with Crocodile on the Sandbank and go from there) - after 18 books in the series, the backstory would take a volume of its own. The novel Tomb of the Golden Bird by Elizabeth Peters is a long and slow. Frankly, after listening to the entire unabridged version, I am still trying to understand what the plot is all about. This book lacks a conflict or a purpose and resolves nothing at the end. Set in the early 1900's in Egypt during the discovery of the Tomb of King Tut (The Golden Bird), several British characters walk around and talk alot, but, not about much. 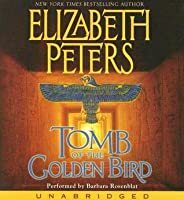 The "sub-plot", the opening of the tomb and the vast collection The novel Tomb of the Golden Bird by Elizabeth Peters is a long and slow. Frankly, after listening to the entire unabridged version, I am still trying to understand what the plot is all about. This book lacks a conflict or a purpose and resolves nothing at the end. Set in the early 1900's in Egypt during the discovery of the Tomb of King Tut (The Golden Bird), several British characters walk around and talk alot, but, not about much. The "sub-plot", the opening of the tomb and the vast collection of treasures contained inside was the most interesting parts of the book, but, again, they were a sub-plot. This is really too bad, it had a great setting with an interesting event to write about, but, just nothing to say. The characters were rather flat and un-interesting. No action, no adventure, no drama, my advise is no read it. This is one you can skip reading. Amelia and Emerson Peabody must stand by and watch as Howard Carter discovers the tomb of Tutankhamen -- a tomb Emerson knew was there, but for which he did not have the rights to dig. Meanwhile, Sethos shows up, embroiled in a secret service plot that will soon pull in all the Emersons. The joy of reading the Amelia Peabody books isn't as much in the plots -- though they are good enough to carry the book -- but in getting together with a group of characters that we've grown to like a lot -- Ame Amelia and Emerson Peabody must stand by and watch as Howard Carter discovers the tomb of Tutankhamen -- a tomb Emerson knew was there, but for which he did not have the rights to dig. Meanwhile, Sethos shows up, embroiled in a secret service plot that will soon pull in all the Emersons. 'You could give it to Margaret,' Ramses suggested.